Parkinson’s disease affects between 1 and 1.5 million Americans, with between 40,000 and 60,000 new cases diagnosed each year. The mean age of diagnosis is 62, although 5 to 10% of individuals with Parkinson’s disease have young-onset Parkinson’s, which manifests before the age of 45. Individuals may be diagnosed in the earlier or later stages of the disease, and symptoms may progress more rapidly in some people than others. However, there is a common pattern to the course of Parkinson’s disease, linked to the progressive loss of dopaminergic nerve cells in the brain and body. Dopamine is a neurotransmitter, or a chemical that transmits messages between nerve cells. Parkinson’s disease is associated with the death of neurons (nerve cells) that produce dopamine, leading to decreased levels of dopamine in the brain and body. The death of these cells causes malfunctioning of pathways that rely on dopamine to carry messages, including the neural pathways controlling movement. Some loss of dopamine cells in the brain is expected with normal aging, but with Parkinson’s disease the loss is accelerated and more pronounced. 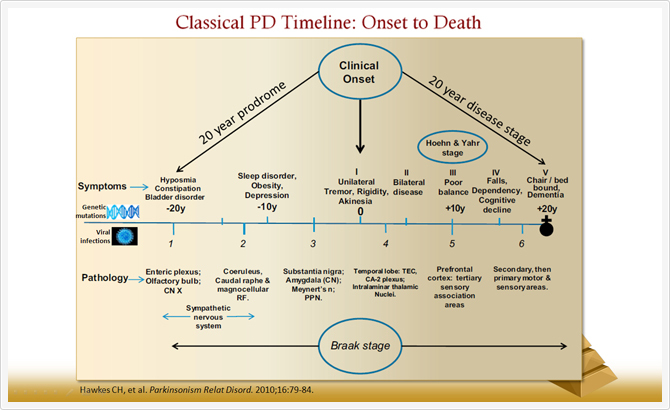 The timeline of Parkinson’s disease follows the pattern of loss in dopamine nerve cells. This progression in cell damage was translated into six stages of the disease by a researcher named Dr. Heiko Braak. In the Braak staging system, Stage 1 of Parkinson’s is a pre-symptomatic stage; at this point in the disease, cell loss is occurring but is not yet significant enough to cause any symptoms. In late Stage 1 and Stage 2, the first premotor symptoms appear. Loss of dopamine nerve cells in the olfactory bulb results in a diminished sense of smell, or hyposmia. Neuronal loss in the enteric plexus (nerve supply of the intestine) results in constipation. Loss of neurons in the sleep centers of the brain, including the reticular formation, may result in sleep disorders, including REM sleep behavior disorder. It is only in Stage 3 that the classic motor symptoms of Parkinson’s disease, including tremor and dyskinesias, begin to appear. This may be many years after the onset of the disease, as measured by loss of dopamine nerve cells. Motor symptoms are related to the loss of dopamine-containing neurons in a specific part of the brain called the substantia nigra. It is estimated that 50% or more of these cells must be lost before the motor symptoms begin to manifest. The loss of these dopaminergic neurons disrupts the function of the striatum, a part of the brain controlling movement. By Stage 4, cell loss has spread to the mesocortex. In Braak Stage 5 and 6, cell loss involves the higher cortical centers of the brain, which control functions such as cognition and emotion. The progressive loss of these neurons may lead to confusion and dementia. Approximately 50% of individuals with Parkinson’s disease suffer from frank dementia by the time they have reached 20 years living with the disease. Other neuropsychiatric disorders can include depression, anxiety, apathy and hallucinations. Sleep disorders, including insomnia and daytime sleepiness, are also common. While the progression of Parkinson’s disease typically follows this pattern, starting outside of the brain and in the brainstem (base of the brain) and progressing to higher centers of the brain including the cerebral cortex, the speed at which that progression occurs and the specific symptoms associated with the dopamine cell loss can vary greatly between individuals. The Colorado Neurologic Institute specializes in creating personalized treatment plans for individuals suffering from Parkinson’s disease.